and diaphragms in pith at nodes. itis vinifera, the European grape, and V. labrusca, the Concord grape. 2. 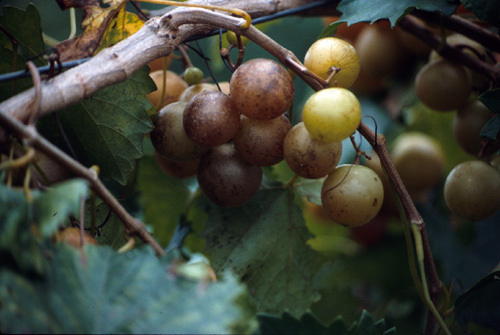 Muscadinia – “Muscadine grapes”; small fruit clusters, thick-skinned fruit, berries that detach one-by-one as they mature, simple tendrils, smooth bark with lenticels, and lack diaphragms in pith at nodes. V. rotundifolia. The muscadine grape, V. rotundifolia Michx. The species is extremely vigorous and disease tolerant compared to Vinifera grapes, and is well-adapted to the southeastern USA. It lacks cold hardiness, so is not grown in the mid-Atlantic, Northeast, or Midwest. Two classes of cultivars occur: 1) pistillate or female, and 2) perfect flowered or hermaphroditic. ‘Ison‘, ‘Cowart’, ‘Hunt’, ‘Noble’, ‘Jumbo’, ‘Nesbitt’, and ‘Southland’ are popular black cultivars, and ‘Carlos’, ‘Higgins’, ‘Fry’, ‘Dixieland’, and ‘Summit’ are popular bronze-skinned cultivars other than ‘Scuppernong’. associated products – jelly, jam, preserves. ‘Concord’ is the major cultivar, responsible for about 80% of production. Other important cultivars include ‘Niagara’, `Isabella’, ‘Delaware’, and ‘Catawba’. The European or Wine grape. Vitis vinifera is also called “Old World grape” since most production occurs in Europe and the other species are native to the New World. This species accounts for over 90% of world grape production. Most of the production is used to make wine, but it is also the primary species used for table (fresh eating) and raisin grape production. There are at least 5000 cultivars of Vinifera grapes grown worldwide, and some estimates put the number of known cultivars as high as 14,000. However, less than 100 make up the vast majority of production. Popular cultivars include ‘Thompson Seedless’ ‘Cabernet Sauvignon’, ‘Merlot’, ‘Pinot Noir’, ‘Airen’, ‘Malbec’, ‘Chardonnay’, ‘Sauvignon Blanc’, and ‘Riesling’. French-American Hybrids. The introduction of the phylloxera or grape root louse to Europe in 1860 devastated vineyards composed of the susceptible Vitis vinifera species, and created a need for resistant rootstocks. Vitis labrusca and other species native to the host range of the phylloxera (north-central USA) were hybridized with Vinifera grape to produce a range of rootstocks with resistance. 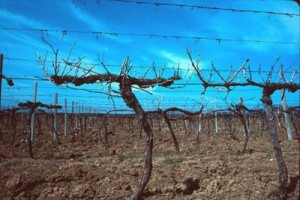 In addition to use as rootstocks, some of the hybrids had both phylloxera resistance and good wine quality attributes. 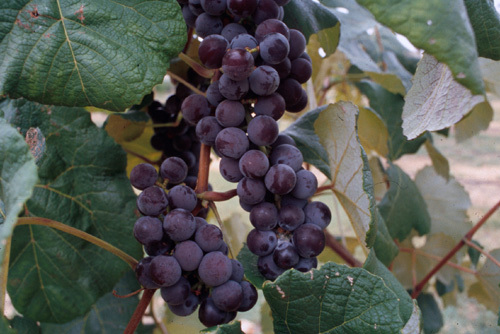 Cultivars include ‘Marechal Foch’, ‘Vidal Blanc’, ‘Chambourcin’, and ‘Seyval’. Table grapes. These are consumed as fresh fruit. ‘Thompson seedless’ is a major cultivar of table grape. Other seedless cultivars include ‘Flame Seedless’ and ‘Ruby Seedless’ (both red), and ‘Perlette’; seeded cultivars in the USA include ‘Emperor’, ‘Ribier’, and ‘Calmeria’. Raisin grapes. ‘Thompson seedless’ is the major cultivar worldwide, and makes up 90% of raisin production in the USA. Sweet juice grapes. Traditionally, this classification was primarily dominated by ‘Concord’, the major American bunch grape. In addition to juice, jelly, jam, preserves, and some wine is produced from sweet juice grapes. Wine grapes. Some wine is produced from all grape species (and many other fruits), but the bulk of commercial production is dominated by V. vinifera cultivars. Several French-American hybrids also produce good quality wine. Vitis vinifera is thought to be native to the area near the Caspian sea, in southwestern Asia, the same region where apple, cherry, pear, and many other fruits are native. Seeds of grapes were found in excavated dwellings of the Bronze-age in south-central Europe (3500-1000 BC), indicating early movement beyond its native range. Egyptian hieroglyphics detail the culture of grapes and wine making in 2440 BC. The Phoenicians carried wine cultivars to Greece, Rome, and southern France before 600 BC, and Romans spread the grape throughout Europe. Grapes moved to the far east via traders from Persia and India. Grapes came to the new world with early settlement on the east coast, but quickly died out or did poorly. This was due to poor cold hardiness, insect, and disease resistance of Vinifera types. Spanish missionaries brought Vinifera grapes to California in the 1700s and found that they grew very well there. Today, US wine production is dominated by California, although Washington, Oregon, New York, Pennsylvania, and Michigan also have significant commercial wine industries based on Vinifera grapes or French-American hybrids. Vitis labrusca is found growing wild from Maine to the South Carolina Piedmont, west to Tennessee. Today, most Concord grapes are grown in New York and surrounding states. Vitis rotundifolia is native from Virginia south through central Florida, and west to eastern Texas. This species has been enjoyed by southerners since antebellum times, and has received little attention outside of the southeast. Several thousand acres are cultivated in the southeastern states, mostly Georgia, Alabama, and Mississippi. 90 countries worldwide on almost 19 million acres. In Europe, average yields are 3.5 and 4.2 tons/acre since the emphasis is on wine quality (low yield = high quality). In the USA yields are twice the world average due to a greater proportion of acreage used for table grapes and raisins instead of wine. United States (2004 USDA) 5,429,500 MT or 11.9 billion pounds. The grape industry is valued at $2.9 billion, making it the highest value fruit crop in the USA. There are 800,000 acres of grapes in production in California. The major grape producing states in order of production include: California, Washington, New York, Michigan, Pennsylvania. Prices paid to grape growers average 16-24 ¢/lb, but this varies greatly. All Vitis are “lianas” or woody, climbing vines. Tendrils occur opposite leaves at nodes, and automatically begin to coil when they contact another object. Vinifera and American bunch grapes have loose, flaky bark on older wood, but smooth bark on 1-yr-old wood. Muscadine vines have smooth bark on wood of all ages. Leaves vary in shape and size depending on species and cultivar. Muscadine grapes have small (2-3″), round, unlobed leaves with dentate margins. Vinifera and American bunch grapes have large (up to 8-10″ in width) cordate to orbicular leaves, which may be lobed. The depth and shape of the lobes and sinuses (spaces between lobes) varies by cultivar. Leaf margins are dentate. Flowers are small (1/8 inch), indiscrete, and green, borne in racemose panicles opposite leaves at the base of current season’s growth. There are 5 each of sepals, petals, and stamens. Ovaries are superior and contain 2 locules each with 2 ovules. The calyptra, or cap is the corolla, in which the petals are fused at the apex; it abscises at the base of the flower and pops off at anthesis. Species in Euvitis may have 100+ flowers per cluster, whereas muscadine grapes have only 10-30. Vinifera and Concord grapes are perfect-flowered and self-fruitful, whereas some muscadine cultivars have only pistillate flowers. Most grapes are self-fruitful and do not require pollinizers; however, pistillate muscadines (e.g., ‘Fry’, ‘Higgins’, ‘Jumbo’) must be interplanted with perfect-flowered cultivars for pollination. Pollination is accomplished by wind, and to a lesser extent insects. Grapes are true berries; small (<1 inch), round to oblong, with up to 4 seeds (Figure 16.1). Berries are often glaucous, having a fine layer of wax on the surface. Skin is generally thin, and is the source of the anthocyanin compounds giving rise to red, blue, purple, and black (dark purple) colored grapes. Thinning is not practiced for most types; crop load is controlled through meticulous pruning. However, French-American hybrids may require cluster thinning for development of quality and proper vine vigor. Grapes are adapted to a wide variety of soil conditions, from high pH and slightly saline, to acidic and clayey. Deep, well-drained, light textured soils are best for wine grapes. Highly fertile soils are unsuited to high quality wine production, since vigor and yield must be controlled. Irrigation can be detrimental to grape internal quality, and is sometimes illegal for wine grapes, but is beneficial for table and raisin grapes where high yields are desired. Vinifera grapes can be characterized as requiring Mediterranean climates, as occurs in their native range. Concord and muscadine grapes are better adapted to humid, temperate climates, whereas muscadines require longer growing seasons and milder winters than concord types. Cold hardiness is a major limiting factor for Vinifera grapes. 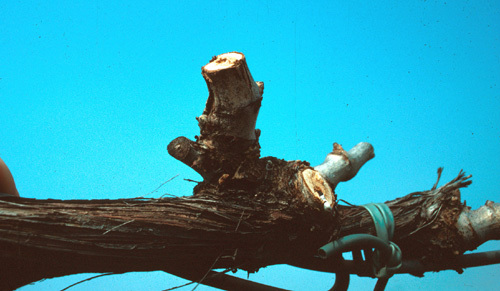 Damage to primary buds occurs at 0 to -10 F, and trunks may be injured or killed below -10°F. Concord grapes are more cold hardy than Vinifera or French-American hybrids, but will experience some damage at -10 to -20 F. Muscadine grapes are the least cold hardy, being killed at temperatures below 0 F, and injured in the single digits F.
Winter chilling requirement is highly variable among grape species. Concord grapes generally have high chilling requirements, 1000-1400 hr. Vinifera grapes have low chilling requirements, 100-500 hr, and tend to break bud early and are frost prone in many regions. Muscadines have intermediate chilling requirements, but require several weeks of warm weather following chilling in order to break bud; spring frost is rarely a problem with muscadines. The most common method of concord and vinifera grape propagation is bench grafting. The most common method of muscadine propagation trench layering, which is done by specialized nurseries. Vitis vinifera was propagated on its own roots from the time of its domestication until about the 1870s. The grape phylloxera (Dactylosphaera vitifolii, Homoptera), also called the grape root louse (actually an aphid), was introduced to Europe from eastern North America in the 1860s, where it caused the most significant pest-related disaster in all of fruit culture. The search for resistant rootstocks led horticulturists to the native range of the phylloxera, where various species of American grapes had coexisted with the pest for millennia, and thus were resistant to it. Initial selections from V. riparia (‘Riparia Gloire’) and V. rupestris (‘Rupestris St. George’) were exported to Europe for use as rootstocks with resistance to phylloxera, but unfortunately had low tolerance of the high pH soils of France. 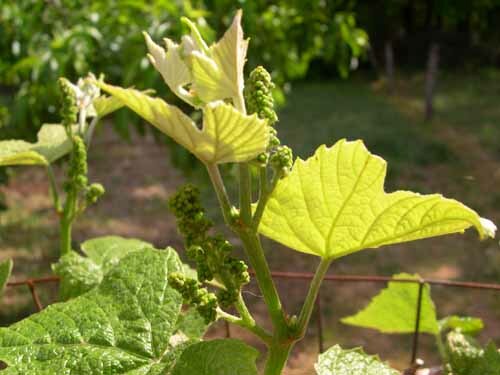 V. berlandieri, native to Texas, is tolerant of both high pH and phylloxera, but difficult to root from cuttings; hence hybrids of V. berlandieri and other easy-to-root grapes were made, many of which are used today. Most grapes are trellised and grown in long, narrow rows spaced about 9-15 ft apart depending on training system. Typically, there is 3-8 ft between vines in a row. Muscadines have similar trellises and row spacings, but are planted 20 ft apart in a row because they are extremely vigorous. Training Systems. Training refers to the permanent parts of the vine, not the one-year-old wood. Two basic forms are used, Head and Cordon. In head training, the permanent part of vine consists of trunk and some fattened stubs or a bulbous “head” at the top. Spurs or canes develop directly from the head. 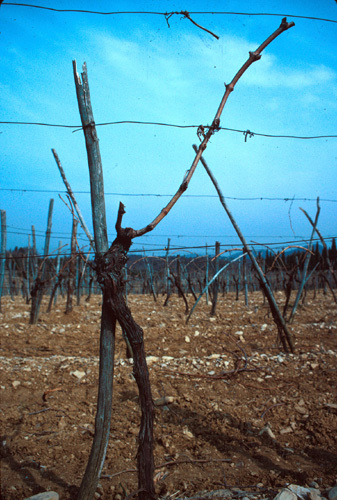 In cordon training, the permanent part of the vine consists of trunk and 1-4 long, straight arms or cordons trained along a wire. Spurs or canes are spaced at regular intervals along cordons. • Pruning is done in the late winter when vines are dormant. • Pruning involves ONLY last year’s growth, or one-year-old shoots. Vine form is accomplished by training (see below). • Balanced pruning is a method of determining the severity or amount of one-year-old wood to remove. One “balances” next year’s crop load with last year’s vigor. It eliminates the need for fruit thinning in most cases. Early research showed that the amount of buds to be left after pruning could be determined on a simple formula that employs the weight of shoots pruned. To start, the pruner removes about 90% of previous season’s growth, then bundles and weighs it (or estimates its weight). For a given grape type, about 20 buds are retained for the first lb of prunings, and 10-20 additional buds are retained for each additional pound of prunings. • Placement of cuts involves the choices of spur versus cane lengths of pruned shoots, with the former a shorter stub than the latter. A small head trained grape vine has been cane pruned, leaving one shoot with several buds. The cane will be bent downward at the tip into the “Tuscan Bow” system. Note the renewal spur on the left side of the head for next season’s cane. Muscadine Training and Pruning. All muscadines are spur pruned since they are highly vigorous and have fruitful basal buds. Spurs are 4-6″ long, containing 1-4 buds. Muscadines are trained to one of the two cordon systems listed above. Spurs are spaced 6″ apart on cordons, removing the weakest, thinnest shoots completely if overcrowding occurs. Spur clusters need to be thinned completely in crowded parts of the vine, allowing adjacent spurs to grow into the bare space. Table grapes. Time of harvest is determined mostly by appearance, including color and size of berries. Raisins. Grapes ripen fully on the vine before picking. ‘Thompson Seedless’, the major raisin cultivar, reaches 22-23 0Brix at full maturity, and this is easily determined with a refractometer. Wine grapes. Harvest criteria, and hence date, depend on type of wine to be made. For any given type, sugar ( 0Brix) is perhaps the most important parameter, although pH, total acidity, sugar/acid ratio, and specific components such as tannins are also very important. Concord juice grapes. The most important parameter is sugar content; grapes must reach a minimum of 150Brix for processing. Table grapes. 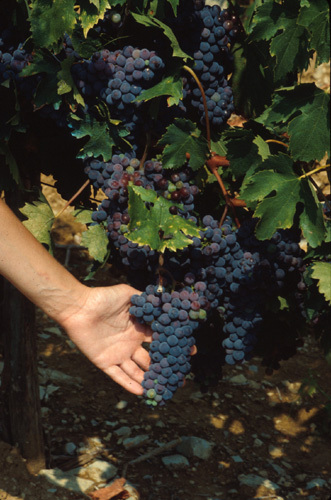 Individual clusters are judged for maturity by pickers, and clipped from vines with minimal handling, and placed in plastic lugs. Raisin, wine and Concord juice grapes. Mechanical harvest is the norm for all processed grapes, except many wine grapes. Wine grape clusters are clipped by hand, and special wines are made from hand-picked berries from particular areas of a cluster. Mechanical harvesters generally have horizontally pivoting arms which smack the canopy, or vibrating fingers which dislodge clusters and berries from clusters. Raisin grapes are often harvested 4-8 days after pruning canes, which causes berries to abscise more easily from clusters. Canes are pruned but left in place, and harvested mechanically when berries are loose. This allows a neat, single layer of de-stemmed berries for harvest onto continuous paper trays. Muscadines. Muscadines ripen unevenly compared to bunch grapes, so individual berries are harvested instead of clusters. The largest, best colored fruits are harvested twice a week, either by hand or with mechanical shakers. Table grapes. Packing and shipping occurs immediately after harvest or after short periods of cold storage. Raisins. Soil between rows is smoothed to accommodate trays or papers used for field drying, and harvested grapes are placed onto drying papers in single layers, or in small clusters. When they are dry enough (13-15% moisture) that juice cannot be squeezed out when pressed, they are ready for curing. Machines collect raisins from continuous paper trays, and fruit are placed in storage for curing and subesquently boxed for sale. • Harvested grapes are de-stemmed and crushed, where the “must” is extracted (“must”=juice+skins+seeds±stems for red; juice only for white). Initial quality evaluations are made and the vinification process is decided upon. Adjustments of sugar level and acid can be done at this point. • Sulfur dioxide is added to prevent oxidation and color deterioration, selectively activate certain yeasts for fermentation, and kill bacteria and other undesirable microbes. • Must is transferred to fermentation vats for sugar alcohol conversion. Fermentation is stopped by racking or dispensing wine into containers; sometimes SO2 is used to stop the process and act as a preservative. 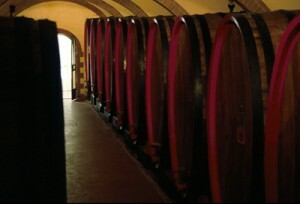 • Wines are filtered, then may be aged in oak barrels for some time prior to bottling. • Bottling takes place at appropriate age, after ultra-filtration for clarity and antisepsis. 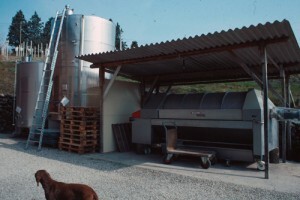 A small scale winery in Tuscany, with a grape press on the right, which extracts the juice, and fermentation vats on the left where the juice is made into wine. 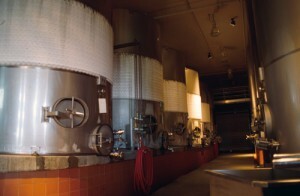 A large scale fermentation vats in Sonoma, California, getting a test of their cooling capacity (note frost formation around the mid portion of the vat). Fresh vinifera grapes may be stored for relatively long periods of time at 310F and 95% RH – 3 to 6 months, depending on cultivar. This is unusually long for a small fruit crop, which are generally perishable within only days or weeks of harvest. Vinifera grapes are nonclimacteric fruits, giving them the potential for prolonged storage. Labrusca grapes are more perishable, lasting only 14-56 days under similar conditions. Muscadines can be stored for up to 3 weeks at 320F and 90% RH. Raisins may be stored for several months at room temp due to low moisture content. Wine quality generally improves with storage up to several years, with red wines capable of longer storage periods than white (in general). Per capita consumption was 19.1 lbs/year, 41% fresh, 36% raisin, 22% juice, and 1% canned. Wine consumption is 2.3 gallons per year.